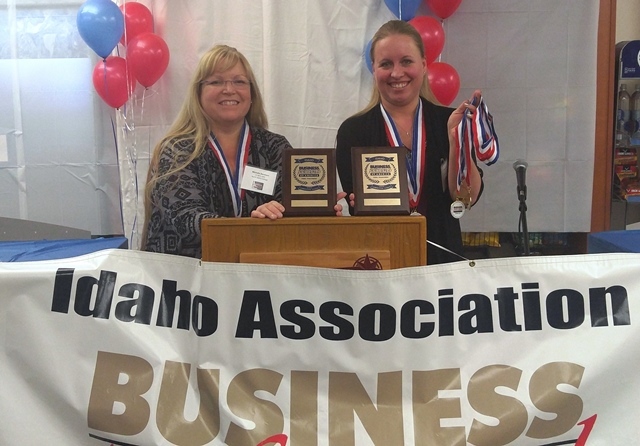 Pictured at the BPA competition in Boise are NIC students Michelle Dennison (left) and Malinda Becker. Not pictured is Lisa Reed, who participated in the competition virtually. Three North Idaho College students from the NIC Administrative Assistant program qualified to compete at the national level by achieving top placement in business-related events at the recent state Business Professionals of America (BPA) competition in Boise. NIC students competed with university and college students from across the state in business competitions through BPA, a national organization for high school and college students preparing for careers in business and career technical fields. The following are the award recipients who qualified for the national leadership conference and competition in Orlando in May. Lisa Reed, from Mullan, first place in Integrated Office Applications, fourth place in Basic Office Systems and Procedures and fourth place in College Payroll Accounting. Michelle Dennison, from Rathdrum, third place in Ethics and Professionalism and fourth place in Human Resource Management. Malinda Becker, from Hayden, first place in Fundamental Desktop Publishing and third place in Fundamental Word Processing.